Another busy day on Winnipeg - or as the case may be... on the shores of Lake Winnipeg. 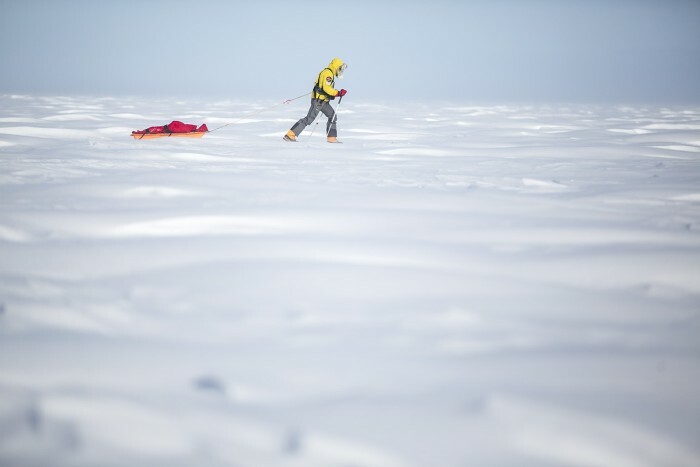 However, the team has taken their first official 'expedition' training steps as everyone now camped on the ice. We actually spent the day in preparation mode, prepping and packing the food and meals we will be eating for the next five days on the ice. The temperatures have been steadily dropping throughout the day as the sky cleared and it is now around -15 F. Snow, ice and cold. What more could you ask for? It's been long non stop days and tomorrow night I will be able to write more from the tent. Image: Gus taking his first polar stride's during yesterday's ski.